Click the ship to access our database of ships and their passengers which arrived at Port Chalmers in the first four years of the Otago Settlement, between 1848 and 1851. FROM THE BANDSTAND Wellington pianist/trumpet player Kevin Clark looks back over 65 years to the changing and sometimes bizarre worlds of jazz, dancebands, composing, recording, broadcasting and musical academia. A valuable contribution to Kiwi cultural history that chronicles cultural shifts in our social history including the end of the six o'clock swill, the rise and fall of booze barns and dine & dance, and the decline of community hall 'socials' with their kegs of beer, plates of savs and raffle draws. ROAD FROM ROSEHALL Mike Munro’s semi-fictional account of the 1850s emigration adventures of a young Scottish Highlander who quits an impoverished rural croft to seek his fortune on the Victorian goldfields, before settling in New Zealand. Extensively researched, this novel combines real-life with the flavour of Scottish emigration to Downunder – the anguish, the hopes, the dread and the excitement. WHEY TO GO The development of whey protein concentrate is New Zealand's biggest waste to riches success story. Beginning in the early 1970s, we led the world in the magical new technology of dairy ultrafiltration to turn huge amounts of surplus whey byproduct from casein and cheese plants into specialised, highly tailored and valuable food ingredients. Written by the scientists, technologists and marketers who pioneered the revolution, it is a fascinating story about how industrial innovation really works in practice. A VICTORIAN LADY'S JOURNEY TO NEW ZEALAND Jane Wheeler, from rural Western Australia, went on a voyage of discovery in 1901, when she sailed with her husband and sister from Fremantle to Auckland, then travelled south to Rotorua and the thermal wonderland. Along the way, Jane kept an extensive and literate travel journal in which she described the voyage, the stopovers in Melbourne and Sydney, and her experiences of what was them known as Maoriland. She makes keen observations on Rotorua's natural wonders and the local Maori. PIANO IN THE PARLOUR Pianos were in huge numbers of New Zealand front parlours through Victorian and Edwardian times and into the 1920s. Central to home and community entertainment, they also stoked the flames of love for courting couples. 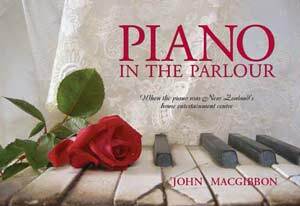 Written by historian and musician John MacGibbon, Piano in the Parlour is a richly illustrated social history that looks affectionately at a time when pianos were the home entertainment system and most cherished domestic possession in New Zealand and many other countries. The book includes words and music for 17 typical parlour songs. LAST SHEPHERD Anecdotes and observations from five decades in the wool industry by former Wool Board chief executive Roger Buchanan. Roger worked in many parts of the industry from wool scouring to international marketing and negotiating as a senior executive in wool grower organisations. He offers penetrating analysis of wool’s rise and fall, and vividly describes highs, lows and fascinating incidents from his experiences in China, Japan, South Asia, Russia, UK, Europe and the Middle East. MEET ME AT BEGG'S, by historian Clare Gleeson, tells the story of Charles Begg & Co Ltd, or Begg’s as it was better known. Founded in 1861 and trading until 1970, Begg's had branches in most New Zealand towns and cities. Synonymous with music, the company retailed and manufactured instruments, published sheet music, promoted overseas artists and supported music in all its facets. It brought overseas innovations and technology to New Zealand by way of gramophones, radios, televisions and a myriad of other electrical appliances. One of the New Zealand's liveliest and best illustrated business histories. DESERT SURGEONS New Zealand's Mobile Surgical Unit in the Western Desert in World War II brought treatment of the injured right up near the battle front, pioneering ideas that were taken up by field medical units in other Allied armies. And they got into some dramatic scrapes with Rommel's troops, who held them in high regard. Researched and written by Michael Shackleton, a surgeon himself, who did similar work in Vietnam. FOR THE DURATION Lt Bruce Robertson left in January 1940 with the first echelon of Kiwi volunteers and served in Egypt, Libya and Syria before being captured at El Alamein. He endured prison camps in Italy and Germany before being liberated by the Americans in April 1945. Robertson wrote it down with great skill when it happened and his diaries and notebooks have now been transcribed and illustrated. One of the more perceptive personal accounts of Kiwi service in World War II, from both active service and POW points of view. YOUR FAMILY'S HISTORY: research, write and publish it. Expanded from lectures given by John MacGibbon at the National Library of New Zealand and Otago University. A great starter for new researchers, and valuable advice and information for people who want to move to the next stage: writing and publishing their family's story. Third revised edition. While others dived for cover, the bravest of the brave went in. Brendan O’Carroll’s new book pays tribute to the courageous ‘Khaki Angels’: stretcher-bearers and other Kiwi frontline medical people who put others before self in two world wars, serving in Gallipoli, Europe, North Africa, Greece, Italy and the Pacific. Khaki Angels also looks at general wartime medical matters: field organisation, what caused death and injuries, what the injuries were like and how they were treated. ... and we meet some heroes. The story of Wellington Returned and Services’ Association (RSA) from its beginnings in 1916 until 2007. Of the many RSAs in New Zealand towns and cities, Wellington has been the most broadly influential because its capital city location meant it worked closely with the national organisation. Until a history of NZRSA is published, this is de facto a history of the RSA in New Zealand. In its heyday, Jaycee was one of New Zealand’s liveliest service organisations and contributed greatly to our social infrastructure. Every community has amenities built or aided by the Jaycees and they also trained leaders for roles in politics, local government and business. This readable and well-illustrated book remembers the fun times and the more serious times, while making an important contribution to New Zealand history and the international study of service organisations. The famous and exciting Long Range Desert Group raid on Barce airfield and town in WWII, from both Allied and Italian sides in the action. Written by foremost LRDG authority Brendan O'Carroll, this full-colour, heavily illustrated hardback will enthrall general readers and Special Forces enthusiasts alike. The definitive story by Bill Carter & John MacGibbon of New Zealand's sheep and wool industry from colonial times to the present day. A major work of New Zealand history. WWII battles, recreation and sightseeing in North Africa and Palestine – photos and diaries of a New Zealand Division gunner who was as talented with his camera as he was with his pen. North Africa and Italy in WWII: Roger Smith's Kiwi classic about the people, the places, the fighting and the psychology.